What is the unit best for? Now, the truth is that fishing is far from being the calm endeavor that everyone think it is. Of course, it could be incredibly relaxed if you want it to but it could also be challenging, thrilling and even a bit dangerous. If you are a fan of excitement and you want to try something truly interesting, kayak fishing should be one of your next undertakings. Regardless of whether you have any experience with kayaks, they are definitely not an easy purchase. There are just so many different things that you would have to have in mind in order to ensure that everything is handled as per the highest standards. This is the main reason for which we hope to make it a bit easier for you by providing you with a quick overview of one of the most reliable options on the market – the Perception Pescador 12.0 Pilot Kayak. If we have to be completely honest, the product is quite multifunctional. 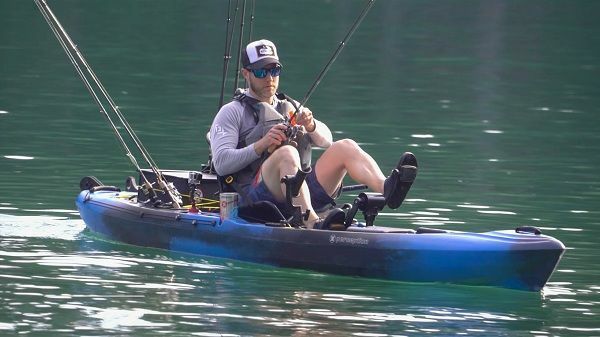 Even though it is intended to be a fresh-water average-sized kayak, it comes with serious pedaling capabilities, making it convenient for offshore fishing as well. This is the main reason for which this is a favorite purchase for a range of different fishing enthusiasts. It is also suited for both beginner and advanced fishermen and it is easy to get used to. As a matter of fact, the Perception Pescador 12.0 Pilot Kayak is one of the most versatile options currently available on the market and even though it is a bit expensive when it comes to it, it is also incredibly convenient and well worth every single penny you will invest in it. Now, it is important to take a look at some of the specific characteristics of the product in order to ensure that everything is handled as per the highest standards. This is definitely of serious importance. This is an important ratio which needs to be considered as it is going to determine a range of different capabilities of the unit. This is an averagely long option, measuring a total of 12 feet in length. This is definitely something convenient. The length of the kayak is going to determine how fast it can go as well as how easy it is to maneuver. At 12ft, this is not the fastest kayak but fishing units are traditionally slower anyways. At the same time, though, it is rather maneuverable and this is going to ensure that everything is handled as per the highest standards. This is something very convenient and it should be taken into account. The width has an impact on the stability as well as the performance capabilities of the kayak. The shorter it is and the wider it is, the unit is going to be more maneuverable which is definitely something that you want to look for. This is a 33-inch standard kayak, making it more than convenient. This is where the interesting part starts. This is not an ordinary paddled kayak – it is one which uses pedals for the propulsion system. This is absolutely considerable and something which is incredibly beneficial. Pedals are going to allow you to develop a substantial speed of a few miles per hour which is definitely great. This is also the main reason for which the product is good for saltwater and freshwater undertakings altogether. Of course, there is a steering control system which is fashioned in a convenient manner. The entire thing is also going to come with a paddle on the side, just in case you want the additional comfort. Obviously, in order to handle the powerful pedal propulsion system, the product needs to have extruded construction. It is made out of durable polyethylene which makes it incredibly reliable. This is something that you want to take into serious consideration. The only drawback of the construction of polyethylene is that it is a bit more spacious and it is going to require special handlers. This is something that you should take into serious consideration because it is going to require you to figure out additional storage space. The advice that we can give you here is to make sure that it is actually indoors in order to protect the kayak from the elements – this is actually something fairly substantial when it comes to it and it is definitely going to be of serious importance. As you can see, there are quite a few different things that you would have to take into consideration when it comes to purchasing a kayak. This one in particular comes in a few different colors but it is definitely one to consider. 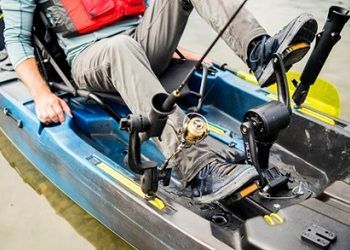 Even though it is on the highest spectrum of the price tag when it comes to regular kayaks, it is actually fairly affordable when it comes to pedal-propelled units. If that’s the solution you’ve decided to go for then the unit is more than great for you. The Perception Pescador 12.0 Pilot Kayak is awesome for a range of fishing undertakings. It’s a sit-on-top unit and it also has wide standing platform so you can rest assured that it would be easy for you to cast and control the rod perfectly. Needless to say, it comes with a range of different additional benefits, each one of which more interesting than the other. It has convenient storage space which is definitely enough for your regular fishing equipment. Cup and rod holders are going to make it even more comfortable, alongside the lumbar support seat which is particularly ergonomic. Even though the product claims that it has handles for easy carrying, it is still the most challenging part of using the kayak. This is pretty much everything you need to know about it and it is a great option for both beginners and advanced fishermen. The product is well worth every single penny.